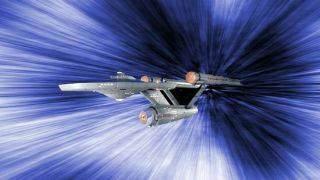 Star Trek's Warp Drive: Are We There Yet? I'm not sure, but I think it was watching "The Amazing Colossal Man" on Creature Double Feature as a kid that gave me my first, foul-tasting dose of technobabble. The doctors were trying to tell Glenn Manning's wife why his uncontrolled growth was causing him so much pain. You see, they explained, the cells in Glenn's body were multiplying at an extreme rate, causing him to get larger. But the human heart is made of only a single cell, so it wasn't growing at the same rate and was under enormous strain. Even in sixth grade, I saw the holes in this. If you've somehow dodged the term until now, technobabble is when the writer fills up some space with, well, stuff. Usually some half-understood scientific term or fact or maybe just total gibberish that sounds neat and fill s a plot hole or two. It's kind of a bluff — I'm betting the reader (or audience member) won't know if this is true or even plausible, and the pseudo-explanation will carry them right over that questionable spot and back into the story. It's easy to spot technobabble in older books or movies. The one-celled heart I was just talking about. The "Creature from the Black Lagoon" as a missing link between man and sea life. Even Isaac Asimov's famed positronic brain, named after a recently discovered sub-atomic particle, seems more like fantasy today than science. Of course, at its worst technobabble is the arrogant belief that the readers or audience are ignorant. I know, because I encountered a lot of it while I worked in the movie industry. Communications satellites that passed behind the moon. Satellite phones with no antennas. Granted, I was usually just the prop master or assistant prop master on these projects, but when I'd point out how wrong these things were, I'd get a faint smileor an eye roll, followed by some variation of "Well, who's going to know?" Often I'd point out that I knew, and I was just some random guy. As I tried to explain to one producer, we were making a sci-fi series — a show for the most nitpicky, well-educated audience out there. "The West Wing" and "ER" didn't have to worry about screw-ups as much as we did. That earned me another eye roll and then our show was canceled a few episodes later. The flipside of technobabble in writing is the hard-science approach. Every fact is carefully researched and verifiable. A fantastic example of this is Andy Weir's "The Martian," a book that's become famous for its attention to detail. Actual astronauts have praised Weir for the realism of his story. You can also see it in Mira Grant's "Parasitology" series or Jonathan Maberry's "Dead of Night." These writers did their homework, dug through books, talked with experts, and created stories that were all-too possible. There's a third option, too, and it's one I tend to take. I did it in my new book, "The Fold." If there's a name for it, it's probably the "lulling you into complicity approach" or something like that. What I like to do is start with everything as grounded as possible. The science, the world, the people. I want my readers to see characters like Mike, Jamie, Reggie or Bob and see something familiar in them. The science that's laid out is very basic, although I don't shy away from more advanced stuff as long as I can explain it in simple terms. In "The Fold," this means talking about basic physics, computer limitations, electromagnetic fields, power needs — concrete, proven things we can all understand and acknowledge. Then, once everyone's comfortable and invested in the story ... I start to bend things away from reality. Just a little. Not too much too fast. My physics may get a little soft. It might even touch its toes against the surface of the technobabble pool. But I still try to keep an internal logic and stay true to the world I've created. Writing this way means, rather than asking the technobabble to support the story, I'm asking the story to support the technobabble. That's a much stronger position to be in. Once readers believe in the world, it's easy to accept things that are happening in this world. Since I've earned their trust, they're usually willing to suspend their disbelief more than they would if I just dropped something on them right at the start. And I've found writing like this makes readers willing to believe in some amazing things. But I still wouldn't ask anyone to believe in a one-celled heart.